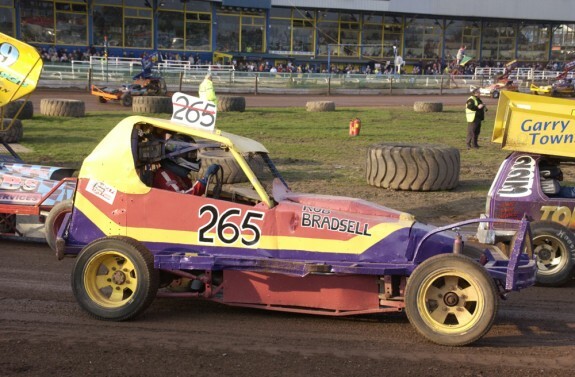 F1Stockcars.com caught up with Veteran driver Rob Bradsell #265 as he embarks upon his 40th! YES, 40th Season in Formula 1 Stockcars. My name’s Rob Bradsell, I’m 63 years of age, my home town is Manchester and this is my ’40 years in the game’ celebration season. Hi Rob, 40 years of racing, do you still recall your debut? Yes, May 6th 1969 (old) Belle Vue. My first race, back then Belle Vue ran three abreast; clutch starts. I started 3rd row back and in the middle. Alan Morrey was the starter. He used to stand on the fence precariously; wobbling about and hanging on. He dropped the flag and off we went. I went though the gears, I ran a 3.8 Jaguar back then. And I’m thinking to myself I can do this. All I need to do is keep my foot down, pass a few cars. There were only seven in front of me; get past them and I can win this, easy. Well after about 2 laps I’ve got my foot right to the boards, pressing down as hard as it’d go and there’s cars passing me! And I’m thinking, why? Why are they passing? I’ve got my foot right on the floor and they are still passing me! How are they doing this? There goes another one passed me! So I think, right I’ll stick with them, start pushing on, instead of braking going into to bends I’ll take another approach. I’d done an advanced Police driving course, so I believed I could do anything. I took another approach into to the bends – wide & tight, a sharper angle. I went in wide then tight across the bend, coming out wide and ripped my back axle off!! That was my first 4 laps of BriSCA Formula 1 Stockcar racing. And I came off track still not understanding how I was getting passed by cars when my foot was flat to the boards. (laughs). Your first car was a 3.8 Jaguar! Yes, it was John Earles (ex 145) car who lived in Macclesfield and was a friend of Malc Shenton (ex 39) who lived in Manchester (local driver). I used to watch Stockcars at (old) Belle Vue; Ellis Ford (ex 3) was my favourite back then, and one day I read in the programme that this 3.8 Jaguar car of John Earles had just had it’s engine rebuilt. It was something (racing not just being a spectator) I thought I’d love to have a go in. So I got my money out my pocket, went out and brought it. And set off not knowing anything about racing Stockcars, thinking I can do this, it’ll be easy! Which brings me to where I am now. Your 40th Year in the sport. Yes, I race purely for fun, That’s always been the way. I enjoy a good Stockcar race; points and championships are not important to me. I’m racing, flying the flag so to say, for all those guy’s that can’t race any more, for whatever reason, be it though ill health or just age. But as long as I’m able to get out there, hopefully entertain but more importantly, fly that flag for a different era of racing and give all those guy’s something to remember. You said you race from a different era, How has Stockcar racing changed over those 40 years? 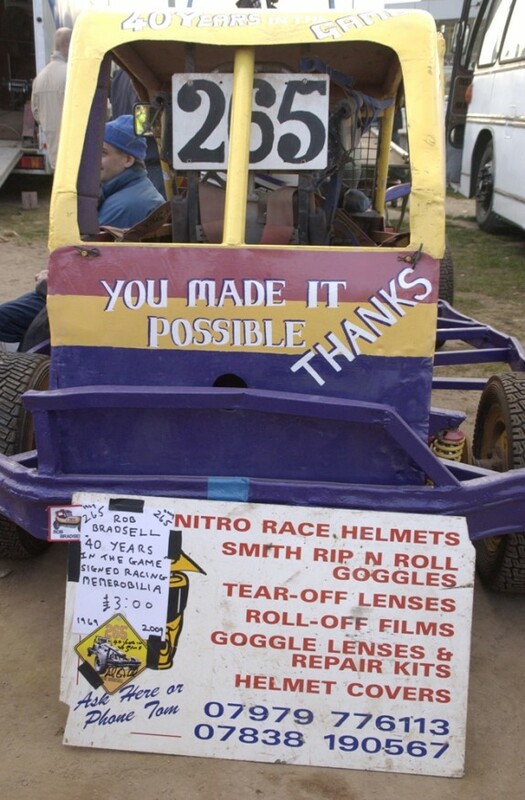 Stockcar racing, very little; society in general has gone though and seen so many changes since 1969. The actual racing I’d say is a lot more closer these days, you’ll always have your outstanding drivers that are head and shoulders above the rest, totally different league to the rest of us. But those ‘us’ are a lot more evenly matched these days. The standard across all grades is a lot closer now. Comradeship, is something I feel has changed quite a bit over the years, don’t get me wrong it’s still very much there in and around racing. But, society has changed so much over those 40 years, values and beliefs are very different to back in the ‘old’ days That’s in life, not just in Stockcars. Everything evolves and changes, not always for the worse, and not always for the better. The world today is nothing like it was in the 1960’s and 1970’s. That’s life. So is this is your last season? Never say never! I don’t know at the moment, I really don’t. I’ve got the car painted up in it’s 1972/3 paint scheme, I’ve got a new sponsor, my first sponsor in fact; P & K Recovery. We plan to do as many meetings (Shale) as we can this year at different tracks. So hopefully Coventry, Kings Lynn, Scunthorpe, Sheffield and Belle Vue will each get a piece of the 265 car on the fence! And we’ll take if from there, it’s too early to say just yet. But in celebration of my 40th year, we’re selling merchandise, so come over and see us in the pits for your very own personally signed memorabilia. You must have had a few cars over the years Rob. My first car was the John Earles (ex 145) 3.8 Jaguar, I’ve had one I built myself, a Doug Cronshaw (ex 396) one, a Dave Chisholm (ex 252) one which my current car has the engine from. I’ve had one off Derek Fairhurst (218); now there’s a story, to this day I’ll tell you it was not rusty, but I lost that committee battle. And my current car is Richard Dobson’s (ex 10) old car from 1978 -1980 period. We’ve had to modernise it a bit to bring it in line with current regulations and reduce the weight, but it still handles quite well so we keep at it. 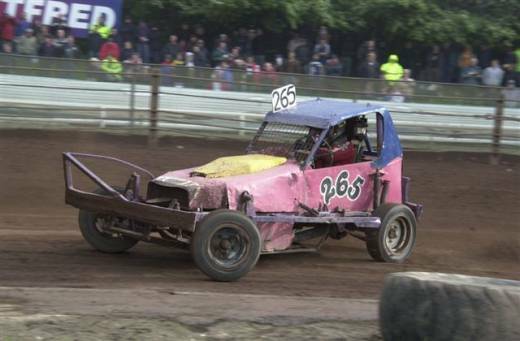 The 265 car in action 2008 Belle Vue. You say you still run the Dave Chisholm (ex 252) engine. Yes, I believe it came into the country in 1977. It’s still standard bore. It’s had a new crank and it’s on it’s 4th cam shaft, but it’s still standard bore. Maybe not quite the same as what a lot of the other guys are running, but we seem to get what we can out of it. What would you say has been your favourite track? I have a few (old) Belle Vue, Nelson, Rochdale, Bradford (shale). Out of those what would you bring back? Guess most people will say (old) Belle Vue, so I’ll mention Nelson. A real drivers track was Nelson, it was unlike anything else there has ever been or likely to ever be. For a start it was square not Oval, so you had to learn how to drive it. Learning how to drive square and not oval is not as easy as you think. I remember how John Lund (53) used to drive it, he’d go wide, really wide and clip the fence at each end. And then you had to dodge the fish heads and all the other refuse they used to chuck on the track. Along with dealing with the track surface itself; shale straights and concrete bends, then to really mix it up you had barrels to avoid – at all cost’s as well. Very fond memories of Nelson. But why not just dig a few holes in here (current Belle Vue) and get us all bouncing about? along with a nice high inside curb, keeping everyone on track between curb and fence. Magic. All of them! I’ve been lucky enough to race in a few big races in my time. Taken part in Grand Prix series, Driver of the year, BriSCA Supreme and Track championships. But the best race… there’s two. The first one was at the last Nelson meeting of the 1972 season, where I won my first ever heat. And the second is the first Nelson meeting of the 1973 season where I (again) won my heat. Those two race’s picked me up. It’s hard to put into words just what it meant to get them two wins, but looking back, if it was not for them then I might not be here today. When things get hard, try harder. And from my own racing experience; I was in the Driver of the year race at Rochdale and I brought a brand new battery just for that race, fitted it in. I was leading race by about half a lap, I thought I had it in the bag, and the new battery failed. And the car came to a complete stop in the middle of the track. And from that day on I’ve always run an alternator. (laughs). Away from Stockcars, what do you do? I’m a Manchester Carers Champion. To cut a long story short, I was a full time carer for both my parents. That explains why I was absent from the tracks for the time that I was. That then inspired me to work for the Alzheimer’s Society. Once my contract finished for that organisation, I took on the role of a Carers Champion. It’s purely a voluntary role and can be very time consuming but it’s something I truly believe in and am very passionate about. Thanks so much for your time Rob, Everyone here at F1 Stockcars.com wishes you all the best on your ’40 years in the game’ season. Keep that flag flying! And the wheels turning. Hopefully we’ll catch up with you again in the season. Back panel of 265's 2009 car. The end?